Official synopsis: "‘YOU’RE THE LAST OF THE WEREWOLVES SON. DON’T FIGHT IT . . . CONQUER IT.’ When the air is clear, sixteen year-old Drew Ferran can pick up the scent of a predator. When the moon breaks through the clouds, a terrifying fever grips him. And when a vicious beast invades his home, his flesh tears, his fingers become claws, and Drew transforms . . . Forced to flee the family he loves, Drew seeks refuge in the most godforsaken parts of Lyssia. But when he is captured by Lord Bergan’s men, Drew must prove he is not the enemy. 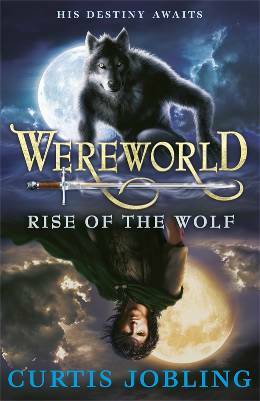 Can Drew battle the werecreatures determined to destroy him – and master the animal within?" This was the first book I read in 2011 so it had to make a massive impact. The first book of the year should always be a good one right? No pressure then! And Wereworld certainly didn't disappoint for a second! It ran along at a brilliant pace, twisting and turning in just the right places to keep you reading. I actually read it when it was a cold, rainy night and I was home alone (scary!) and this kind of added to the reading experience. The tense parts made me feel all gurgly in the pits of my stomach. I'm a bit of an intense reader at times, my mum calls me The Nutty Reader, because when I am well and truly taken in by a book I am quite literally insane. I shout, laugh, jump up, walk around in circles. And I'm not even joking! Ha. Sadly... Well Wereworld had me in a hither. Anyway, back to the book, I cannot praise Curtis enough on this one, and Puffin for publishing it. A brilliant way to start the year, in all honestly. If you do nothing else in 2010 make sure you read this one. Just look at that cover. It's worth owning it for the cover art alone let alone what is inside! My thanks to Puffin for my copy! Great review - and yes please to the 3D!!! Great review. I really loved this book, I can't wait for the next instalment. Announcing 'Vampirate Week' - June 2011!